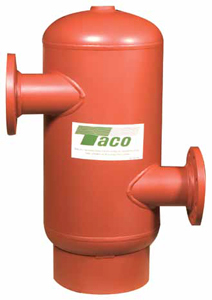 Designed for use in hydronic heating or cooling systems, Taco's compact, highly efficient ACT air separator provides air separation while minimizing space requirements. It clears the system of free air and reduces un-dissolved sediment to save money, energy and component wear. Unlike many competitive models, each ACT unit is designed and constructed to the requirements of Section VIII, Division I of the ASME pressure vessel code as standard. Developed for flow rates up to 12,500 GPM. Designed for working pressure of 125 PSI @ 375 degrees F. Optional 150-PSI maximum pressure units and 375 degree F maximum temperature units are also available.